In the fourth pAsuram, AzhwAr says “I don’t have any means in me which will lead to you; hence you should find out a means and mercifully bestow that to me”. Also explained as AzhwAr saying “You who eliminate everyone’s hurdles and protect them without any restriction, should mercifully ensure that I reach your divine feet”. dhEvA! surargaL munik kaNangaL virumbum thiruvEngadaththAnE! thiruvEngadaththAnE – Oh one who resides in thirumalA! puNarAy – mercifully teach me. Oh emperumAn who is having SrI SArnga bow which is shooting fire-faced arrows like rain targeting the lives of demons who torment the world instead of showing mercy, taking pity on it! Oh one who is the aptly beautiful consort for lakshmi who is being the valourous consort and who is pleased after his eliminating such enemies, and is shining due to that! Oh one who resides in thirumalA to be desired by groups of dhEvas and rishis! I am having unconquerable sins which stop me from reaching your divine feet filled with flowers; mercifully teach me the means to reach them. Once nampiLLai mercifully asked nanjIyar “It is said that there is a panchamOpAyam; is it seen in this world?”. nanjIyar mercifully replied “I don’t know; as bhagavAn is the fourth upAyam, talking about the fifth upAyam is similar to some people talking about vyOmAthItha [vyOmAthItha is a claim made by pASupatha followers; they say that rudhra is the antharyAmi for bhagavAn SrIman nArAyaNa, which is unfounded in SAsthram]; I have not heard about this” [The principle here is, nanjIyar did not want to reveal about the secretive fifth upAyam in public]. But while he was mercifully explaining this pAsuram, nampiLLai again asked “It appears that AzhwAr is asking emperumAn to present a separate means to him”, and nanjIyar mercifully responded “Oh! You have misunderstood the concept here; the meaning for AzhwAr’s words is – while you (emperumAn) are present, why I am still not attaining my goal” [nanjIyar is categorically saying that there is no scope for any upAyam other than bhagavAn in this case, as AzhwAr is simply lamenting about the delay]. mahAbhAratham “sAham kESagraham prAptha – thvayijIvathyapiprabhO” – [dhraupadhi said] While you (krishNa) were present, I was insulted by someone who dragged me by my hair! Where is the match for your existence and my insult? prabhO – I could remain relaxed if you too were a woman like me; while you are capable of eliminating the insults, was I not still insulted! A disciple of nanjIyar asked him “While emperumAn is the means, I am not seeing what we accomplish through our prapaththi”, nanjIyar, closing his ears [in anguish], replied to him “The most confidential principle, which was explained by our AchAryas starting from nAthamunigaL through succeeding disciples, has to be explained by me who is a great sinner, to you who do not understand its greatness!”, beating on his head [again in anguish] and brought him into the sanctum of emperumAn. Just as emperumAn‘s divine form, the qualities of such divine form and the qualities of his true nature, are part of the goal for the nithyasUris and mukthAthmAs, for a qualified mumukshu (one who is desirous of liberation), the dhvayam [which emphasises on surrender] itself is part of the goal. A A ennAdhu – To please ISvara means to show compassion towards his world. nanjIyar mercifully says “If one cannot tolerate the suffering of others, one can oneself determine ‘I have connection with bhagavAn‘; but if one considers ‘it is alright for others to suffer’, then one can withdraw saying ‘I have no connection with bhagavAn’ “. Here, others means everyone other than self. But should we show compassion towards the unfavourable? Yes, that is the opinion of AzhwArs/AchAryas. We should remain [concerned for them too] thinking “Oh they have not lost their evil interests and become favourable”. When emperumAn himself says in SrI rAmAyaNam yudhdha kANdam 18.34 “yadhi vA rAvaNa svayam” (Even if rAvaNa had come [bring him along, he too is given refuge]), should those who live in his world not have the same attitude? But how does it align with what is said in thiruvAimozhi 10.7.5 “naNNA asurar naliveydha” (emperumAn appears to destroy the demons who show hatred)? Well, when the hatred is deeply imprinted in them, he slays them. Just as the sacrifices done in yagyas such as agnIshOmIya are good for the animal that is sacrificed, this killing of demoniac persons is also good for them, since he rids the soul of the body which facilitates hatred and leads the soul into the path of goodness. A A ennAdhu (ulagaththai alaikkum) – While the demons should take pity [on the sufferers], they will further torment them. It cannot be thought “they are fighting for wealth and lust; both are desirable [and so are fighting]”; instead of that, they are just tormenting the world. They would torment others just as they eat, wear clothes etc., i.e. as a natural activity. asurar – The reason for this is they are demoniac by nature. vANAL mEl – While their valourous decorations remain intact, emperumAn attacked their life. That is, eliminating their life span. thIvAy vALi – When perumAL (SrI rAma) launches, it can be said as arrow. But once it reaches the target, it will be like fire ball piercing through. When the arrow leaves the string of SrI SArnga bow, it will travel like a branch of fire growing out. This is how it is when his qualities are subdued [also said as, when the arrow leaves the string]. SrI rAmAyaNam yudhdha kANdam 16.22 [vibhIshaNa tells rAvaNa] “dhIptha pAvaka sankASai:” (resembling blazing fire) – this is how it feels when the arrow hits someone. Sithai: (Sharp) – Before realising being hit, it will pierce through and fall down on the other side of the body. 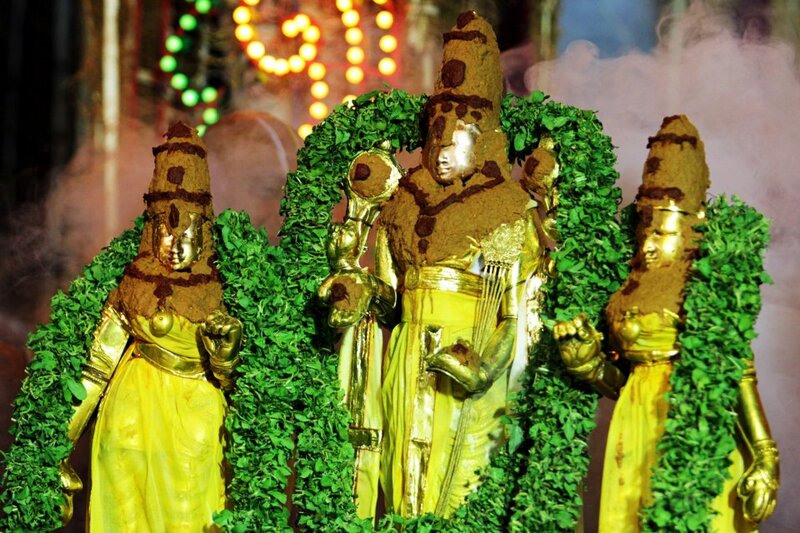 kAnchana bhUshaNai: (adorned with gold) – they have two different manifestations (being ornament as well as weapon). As said in periya thirumozhi 7.3.4 “sarangaLANda thaNdAmaraik kaNNanukkanRi en manam thAzhndhu nillAdhu” (My heart will not wait for anyone but SrI rAma who has reddish lotus like eyes and who controls the arrows), it is his bow and arrow which help capture the favourable ones too. na thvAm ichchAmi (do not wish to see you killed) – while one can live being the target of such beauty, I do not wish to see you being killed. I don’t know what you are thinking. When I see him standing with the firm bow and the arrow, he looks so beautiful to me; just as one will drown in a lake which was dug to quench the thirst, I can’t see you fight with him and get killed instead of enjoying his beauty. He is known as a lake as said in thiruvAimozhi 10.1.8 “dhayaradhan peRRa maragadha maNith thadam” (the green-gem like pond who is born to dhaSaratha). vALi mazhai pozhindha silaiyA – As said in SrI rAmAyaNam yudhdha kANdam 94.18 “Saravarsham vavarshaha” (did he not pour down a rain of arrows? ), he poured down arrows heavily. thiru mA magaL kELvA – Here AzhwAr is speaking about the one who joyfully embraces after seeing him defeat the enemies. One who does as in SrI rAmAyaNam AraNya kANdam 30.39 “barthAram parishasvajE” (embraced her husband). tham dhrushtvA – She saw emperumAn, who should be warded off evil eyes even normally, in his valourous form after defeating the enemies. SathruhanthAram – Not only he slaughtered them without any impact for his own body, he also cut them into pieces. Previously when they were in SrI ayOdhyA, she would hear from the relatives about his hunting trips “when he went for hunting, he fought like this; he stabbed a tiger, he stabbed a lion”. She witnessed all such acts when he started fighting. maharshINAm sukAvaham – one who eliminated the enemies of the sages and let them live there peacefully. For those who knew their true nature – while they could have defeated the demons using the power of their penances, they depended fully on SrI rAma. SrI rAmAyaNam AraNya kANdam 1.21 “garbabhUthAs thapOdhanA:” – those who fully depend on emperumAn even when they lost their prime wealth. While they had the wealth of their penance, they were also like foetus in the womb (fully dependent). While the foetus can try on its own, when it is in the womb, only the mother will have to protect it; similarly these sages were also fully dependent on emperumAn for his protection. emperumAn protects the favourable ones and annihilates the unfavourable ones, only for pirAtti’s pleasure. babhUva – On seeing his lone battle with the fourteen thousand powerful demons, she remained frightened and lifeless thinking “what will happen now?”, but now she regained her life. bhU saththAyAm – The root of the word bhUtha, that which exists. hrushtA – As she regained her life, the bliss which naturally exists there also manifested. vaidhEhi – Just as the daughters of the teachers who teach vEdham would have memorized vEdham just by hearing their fathers teach the students, sIthA (vaidhEhi) is born in the vidhEha clan/dynasty which knows the nature of valour; how will my father, who gave me in marriage to him just for breaking a bow, feel when he sees his victory over fourteen thousand demons on his own! parishasvajE – Fourteen thousand demons who were equivalent to rAvaNa in strength and were respected by him, shot arrows on SrI rAma and hence his body was full of scars of war; she pressed all those spots with her divine bosom to comfort him. thiru mA magaL kELvA – Am I losing you due to your lack of strength? Or is it due to lack of purushakAram (recommendation from pirAtti)? dhEvA – The radiance which he acquired after her embrace [dhivu – radiance]. Alternatively, it could highlight the radiance acquired on eliminating the enemies. (The divine abode thirumalA which is considered and glorified by the dhEvas and rishis thinking “This is the abode where the slayer of our enemies resides” and hoping that their desires too will be fulfilled). surargaL … – The divine abode where all the favourable ones wait for him patiently. pU Ar kazhalgaL – Explained as the divine feet which cannot sustain without the flowers. Also explained as divine feet which are similar to flowers. aruvinaiyEn – He is capable of eliminating the hurdles; I have unlimited desire; his divine feet are infinitely enjoyable; still, I am having sin to not reach there and enjoy the same. porundhumARu puNarAyE – AzhwAr is considering himself to be similar to sIthA in aSOka vanam. puNarAyE – AzhwAr says “you should create the means to make me reach your divine feet” or “you should ensure that I reach your divine feet”. This entry was posted in thiruvAimozhi, thiruvAimozhi 6th centum on June 18, 2018 by Sarathy Thothathri.